Pipework for fire sprinklers is either CPVC or galvanised steel. It does not support fire, and will only char when subjected to flame. In fire conditions, it performs superbly, and it has a twenty year proven track record for this application. As may be expected, the system is fully tested and approved by UL, FM and LPCB, as well as being accepted by all leading insurers. In the UK the product has also been tested and is listed by WRAS for use with fire sprinkler systems only. CPVC provides a tough, smooth, large diameter pipe which has very low friction loss (Hazen-Williams C Factor=150). Unlike metal systems, the material is highly resistant to corrosion, pitting and scale build up, giving long-term reductions in maintenance costs. On site, sprinkler contractors can fabricate CPVC systems much more easily than metal systems. Materials can therefore be delivered directly to the job site with no prefabrication – providing a significant cost saving. Also CPVC pipe and fittings weigh a lot less than metal, making them easier to handle during transport and installation. 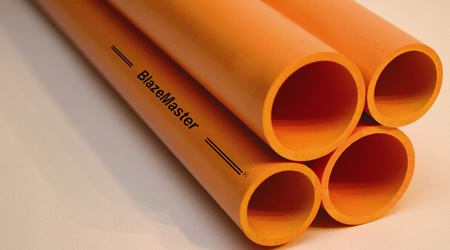 CPVC pipe is also a very clean product to install. Secure joints are made using a cold solvent welding process which requires only a few simple tools. Correct lengths can be cut and prepared on the spot, eliminating saws, threaders and torches. There is no oil or grease on the pipe – as is often the case with steel – which minimises the risk of damage or mess in the work area. This is especially important in retro-fit applications, where costly damage to decor is always a possibility. Another key factor for retro-fit installations is that buildings can be occupied while fitting a CPVC system. Hotels, for instance, don’t have to lose occupancy – and revenue – because of the speed and ease of the installation process. There are occasions where steel is required. This may be in areas where a higher degree of mechanical protection is required of where the client has specified steel. 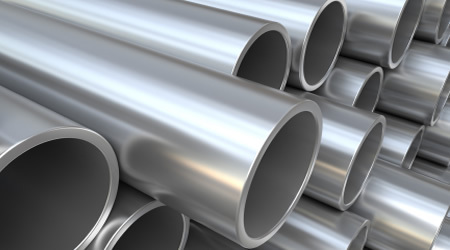 Steel pipework will likely be considerably more expensive due to the time taken for installation.